Please be advised: Players from United Kingdom are not accepted at Pokie Pop Casino. Try one of the three casinos below, as they welcome UK players with great bonus offers! Pokie Pop Casino is an Australian online and mobile casino that offers a wide range of classic and multi-line online pokies from six vendors, including Betsoft and Quickspin. Though new, the online casino has attracted the attention of the player community through its pop art theme and generous opening bonus. Pokie Pop, an online and mobile casino based on the pop art theme, has just gone live. Its innovative theme, player friendly website design, multi-platform portfolio, and generous opening bonus make it a great online casino for Australian players. Pokie Pop Casino offers two gaming options; instant play and mobile gaming. In other words, the online casino operates on a sophisticated instant play gaming platform that is well optimized for play on multiple devices, including mobile devices. Players can access their gaming accounts on any device of their choice and from any location in the world provided they have fast and reliable Internet connection. 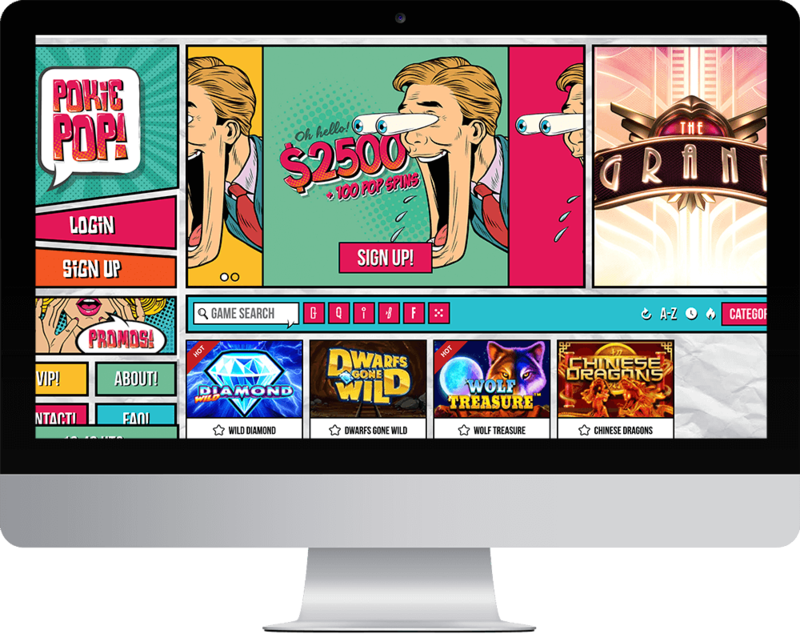 To get started at Pokie Pop, players only have to create a new gaming account. There is no need for any download and installation procedure. The registration procedure takes just a few minutes at the online casino. Players have to fill in their personal details, read the terms and conditions, and verify their email address. Once they have completed the registration procedure, they can log in to their accounts, make a deposit, and start playing their favourite online casino games. 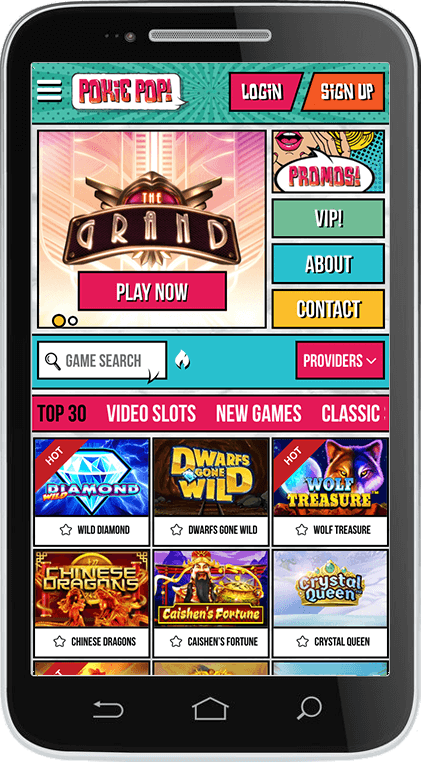 Pokie Pop displays its game library on its homepage, enabling players to sort games according to provider or category. Players can choose from a wide range of pokies at Pokie Pop. If they prefer the traditional gaming experience, they can play classic or three-reel pokies. If they prefer feature-rich games with complex bonus features and brilliant illustrations, they can choose from multi-line bonus pokies. Or they can try hitting a progressive jackpot by playing a progressive pokie. Some of the most popular pokies at the online casino are Wild Diamond, Mighty Arthur, Wins of Fortune, Spinions, Big Bad Wolf, Absolute Super Reels, Genie Gone Wild, Pearl of the Orient, and Money Train. Players can try their luck playing video poker games such as Deuces Wild, Jacks or Better, Bonus Poker, and Double Double Bonus Poker. Pokie Pop’s selection of progressives include pokies, blackjack games, and video poker games. Players have to bet max in case of pokies or place a side bet in case of table & card games to qualify for the progressive games. – Pokie Pop offers several variants of popular casino games such as craps, baccarat, blackjack, and roulette. Pokie Pop’s instant play software platform is optimized for fun or real money play on mobile devices such as Blackberry, Windows, iOS devices, and Android devices. To play on the move, players need just three things—a mobile device that supports HTML5 technology, a gaming account at Pokie Pop Casino, and fast and reliable Internet connectivity. Playing at Pokie Pop Mobile Casino is just like playing on its desktop version. Almost all the games are available for mobile play, and that includes pokies, table & card games, video pokers, and progressives. Players can participate in promotions, claim bonus offers, win big money, and withdraw their winnings in a safe and secure gambling environment. Since Pokie Pop is brand new, it has not yet designed any promotions for its existing players. However, it is offering a grand three-level welcome bonus of up to $2500 plus 100 free spins to attract new customers. The only promotion that Pokie Pop Casino offers at present is its three-tiered welcome bonus. However, we are watching the promotions page of the online casino. We will update this space as soon as the online casino displays details of any new promotion on its website. We encourage you to keep visiting this page for news of the latest promotions and bonuses. Pokie Pop Casino does not offer any VIP Club at the time of writing. Making deposits and withdrawals at Pokie Pop Casino is incredibly easy and absolutely safe and secure. The online casino takes the issue of player security and privacy very seriously. It has implemented a number of security measures to protect players’ personal information and details of financial transactions. Credit/Debit Cards: Visa & MasterCard credit/debit cards are the most used ways to make payments for goods and services purchased online. Thanks to features such as SecureCode and Verified by Visa, Visa & MasterCard transactions are 100% safe and secure. Your deposits are instantly credited to your account and you can start playing for real money without wasting any time. Neosurf: If you are not comfortable about revealing your card details to an online casino, you can use the prepaid voucher service Neosurf. It is safe, secure, and absolutely anonymous. Your funds will be instantly credited to your account and you can start playing in seconds. The online casino does not charge players for making deposits or withdrawals. However, it charges a commission of 10% if players withdraw deposits that they never used for gambling. Bank Transfer and Visa are the only two payout options at Pokie Pop. The minimum/maximum withdrawal limits are $20/$10,000 per week. But these limits do not apply to progressive jackpot wins. If you are lucky enough to win a progressive jackpot, you can withdraw all your winnings in one lump sum. Your payout requests will be in pending state for a day. Then, the online casino takes another working day to process your payouts. Finally, the online casino will credit your winnings to your personal account. This makes the withdrawal time frame for both Visa and Bank Transfer somewhere in the range of 3 – 5 banking days. During the pending period, the online casino verifies player details to make sure that the winnings will reach the right person. Players have to cooperate with the online casino by submitting copies of documents that prove their identity, age, nationality, and so on. If players fail to cooperate with the verification procedure, the online casino will not process their payouts. Pokie Pop’s customer support team is available round the clock. Its customer support agents are well-trained, highly qualified, courteous, and adept at giving personalized responses. Visit the FAQ: The Frequently Asked Questions (FAQ) section contains answers to commonly asked questions. New players will definitely find the information they are looking for on this page. If they don’t, they can check out the following options. Send an email: Send an email to pophelp@pokiepop.com. Launch Live Chat: Click on the Live Chat option to instantly open the live chat window and talk to a customer support agent. Since Pokie Pop Casino is brand new, we haven’t yet got the opportunity to test drive it. But the online casino is handled by a team with ample industry experience. They know exactly how to run an online casino business and how to keep existing players happy. Judging the online casino’s theme, website design, customer support, multi-vendor games, and opening bonus, we are sure that this is another great online casino for Australian players. That’s why we recommend this online casino for Australian players. We encourage you to sign up without wasting any more time and grab that welcome bonus before the online casino decides to reduce its size. Don’t miss this great bankroll boosting opportunity.